On Sunday I went to play some boardgames, which often includes games I have never played before. 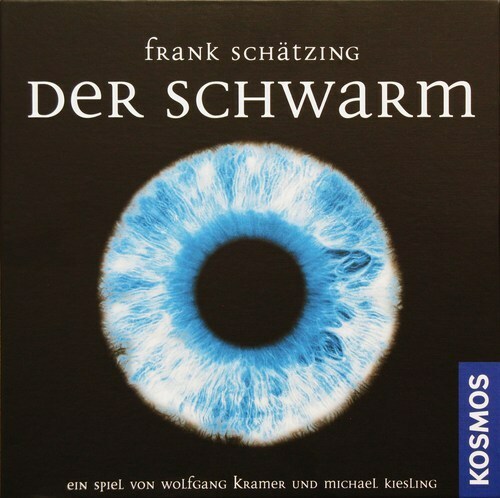 One of the games we played was Der Schwarm by Kosmos, which was carefully unwrapped by Jon as all looked on. Kosmos is book publishing company so amongst the games they publish is a line of literature-based games of which The Swarm, to give it it’s name in English, is one. Based on the novel by Frank Schätzing where the world is facing an ecological catastrophe caused by previously unknown marine life forms. Each player represents a nation sending their scientists out to confront the threat. Although we played the German version, you may be pleased to know that Z-Man games have now published an English edition (the game itself is fairly language neutral, its only the rules and player quick-ref boards that were in German). The game has a central player board on which shuffled tiles are placed face-down to form uncharted sea surrounded by land squares (where players may start from and form new bases on). The tiles show either 2, 3, or 4 connection swarm patterns and in the game you collect these then place them down to form connected networks. Around the edge of the board is a score track and each player starts on 20 research points, so obviously meaning they can go down when spent. Hmm this sounds like a train game. Around the edge of the board are placed Action Cards, and players rotate in player order selecting a card, the first available card costs zero, opting to take the second instead costs you one research point, the third instead two points and so on. Cards are shifted to close gaps after one has been chosen. So that’s why a positive point balance is needed at the start. The Action card line consists of 13 cards (which are shuffled and randomly placed each round) as we were playing 4 players, 3 or 3 player games have less, followed by two blue special action cards (the game has 6, 2 used each round), a green research station action, finally followed by a stack of turn-order cards where you choose what order you want to play the turn at and select a special power for the turn. The action cards allow specific actions such as build research station (where you place a station and a researcher on that station), place/move a ship (so you can pick up undiscovered sea tiles into your hand), utilise a researcher (place additional researcher on a base, or place down network tiles upto the total number of researchers you have on the board), and monster moves. The game consists of three turns, on each you take turns selecting action cards (paying the requisite research points if you opt to not take the first one available), once all action and turn order cards have gone you then (in the new turn order) take turns performing an action card. Each player also has a Joker card to give them an additional action that can be used so long as action cards are left to be played, which is nice as it allows any action to be carried out even if you don’t manage to grab the required card. Once all actions ave been carried out each player has their largest network scored. Then onto the next round. After the final round there are bonus points scored for having bases on 2,3, or all 4 sides and another if you have connected those bases to the central Swarm Queen square. If you have played railway games I’m sure there are some aspects of the above that sound awfully familiar to you. It does have some nice aspects like the monster attack actions where points are deducted from whoever the monster attacks and added to your score, the number of points is dependent on how far they are along the track (and if they have chosen the special turn-order ability of reducing attacked scores by one). Mike, who won the game, decided it was best to keep his score down to avoid attraction of monster attacks but ultimately ignore their threat and concentrate on building a network. On the initial reading of the rules, I wasn’t the only one who thought “hmm sounds like a train game” and Mike who I don’t mind admitting is better at train games than me got a winning strategy sussed. It was an enjoyable game, though I came third only because Richard who ended in 4th as the last action of the game did a monster attack on two of my bases. That probably sounds bitter, and it isn’t meant to – I knew I hadn’t won and hadn’t done enough to secure 2nd, but it sounds dramatic if I say “oh if it wasn’t for that last action of the game by the player in last place”. Having played the game once I would play it again, especially as I would now say “don’t be afraid to spend research points”. I have played several economic train games where “money is tight” and a bad choice or two can lose you the game so I was over cautious on paying more than one or two points for an action. On hindsight it is worth doing if it allows you to complete what you need to do in the round. In the final round if I had spent 4 instead of 1 point to grab a researcher instead of a ship I would have been able to score 30 for 3 bases instead of 10 for 2 (plus an additional 4-7 points dependent on which space it was placed) and been 2nd or even first if I’d denied Mike. Of course if Jon, who ended as second had done similar (he mentioned at the end he should have got another researcher as he ended with an under utilised ship action), then he could have won. Mike had said he’d gambled on a last round dash to win, and it paid off because he ignored monster attacks whilst others hadn’t (Jon stated he expected me to use a crab attack action to bypass my two bases, so he ensured he got the monster defence turn-order privilege, though I opted to use my joker to increase my network size).